The Energy Stewards program (left) and Promotores de Energía program (right) graduate their first classes of volunteers/ambassadors. WSU Snohomish County Extension trained volunteers to conduct energy literacy outreach to local residents and Spanish-speaking communities. The training, funded through AHB Extension, covers basic energy concepts, alternative energy topics, and energy conservation tips. The Energy Stewards program graduated its first class in May, with a team of eight volunteers. A similar program, offered completely in Spanish, trained Latinos to become Promotores de Energía (Energy Ambassadors). The Promotores program graduated its first class in July. There are currently eight active Latino Energy Ambassadors. “Many Latinos care about the environment because this is where they and their children live. They are a group of people that are incredibly curious and eager to learn about how everything works. Energy literacy is just one of numerous topics they are curious to learn about in order to understand it more and so they can save money,” explains Yolimar Rivera Vázquez, WSU Extension Natural Resources and Latino Engagement Projects Coordinator. “Promotores de Energía are committed to volunteering and giving presentations in their own communities. They know how important it is to disseminate information that often doesn’t get to Latinos. Promotores want to share with others that there are ways to save money by conserving energy and that people can make energy choices for the better,” says Rivera Vázquez. Volunteers learn about using poplar trees for biofuels at the Pilchuck Demonstration Site. The Energy Stewards visit the Qualco anaerobic digester near Monroe, WA. As part of the training, both groups of volunteers and some of their family members visited the Pilchuck Demonstration Site in Stanwood, WA. While walking among the poplar trees, they learned about the opportunities and challenges of utilizing poplar for biofuel. The Energy Stewards also visited the Qualco anaerobic digester near Monroe, WA, which is turning cow manure, food scraps, and expired soda into biogas for electricity. Equipped with their new knowledge, trained Energy Stewards and Latino Energy Ambassadors are giving presentations within their communities, conducting outreach at various events, running an energy literacy social media campaign, and informing the public about how energy impacts our lives. So far, volunteer activities include connecting with visitors at two events (2016 Evergreen State Fair and the Latino Expo at Edmonds Community College), leading conversation circles at the Bothell Senior Center, conducting sixteen presentations, and posting on social media. Together, the Energy Stewards and Promotores de Energía have reached a total of 508 contacts. Outreach efforts will run through the end of October and continue into the future if further funding can be acquired. For more information or if you would like to get involved, please contact Yolimar Rivera Vázquez (yolimar.rivera@wsu.edu). 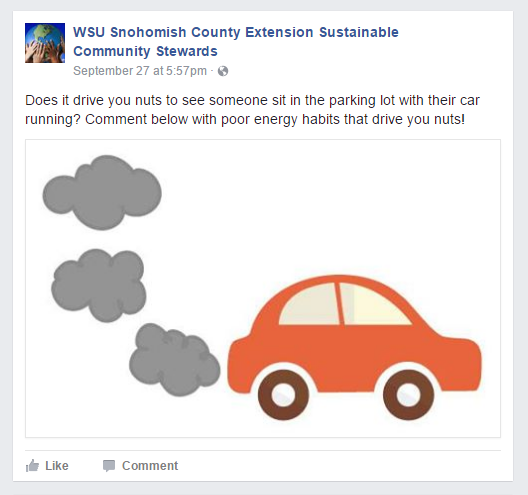 You can follow the social media campaign on Facebook through the WSU Snohomish County Extension Sustainable Community Stewards page. The Energy Stewards program is posting about energy literacy on the “WSU Snohomish County Extension Sustainable Community Stewards” Facebook page.